Slice paneer into small cubes.Keep aside. Grind cashews into powder .Keep aside. Puree tomatoes,green chilli and ginger.keep aside. 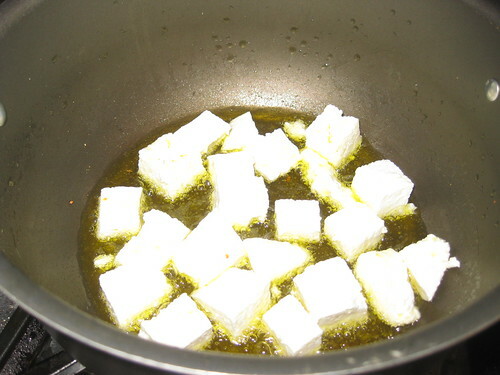 Add oil in a pan,over medium heat.Shallow fry paneer cubes till they turn slightly brown.Remove from pan and place over paper towels to absorb excess oil. 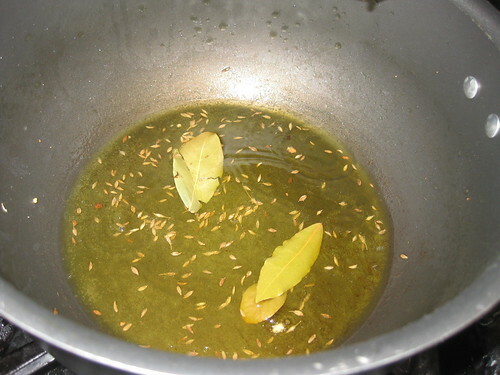 Increase heat to medium high and add bay leaves,cumin seeds and hing.Stir for a few seconds. 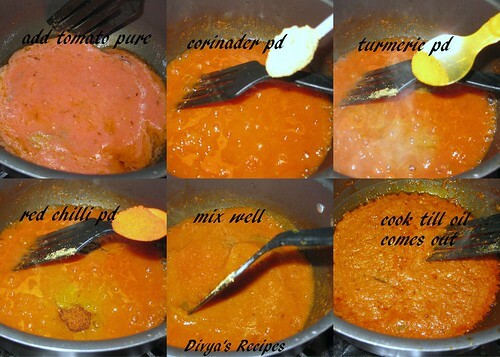 Add tomato puree,coriander powder,turmeric powder,red chilli powder.Cook the mixture,stirring occasionally for 2-3 minutes.It will reduce to half its volume and start separating from the oil. 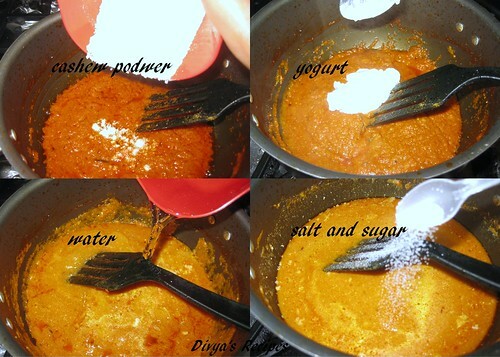 Add sugar,cashew powder and yogurt.Cook for another minute then add 1 cup of water and salt and bring to boil. Add paneer and cover the pan.Simmer for a few minutes over medium low heat,till gravy is slightly tick in consistency. Remove from heat add gram masala and chopped coriander leaves. Mix gently,cover the pan and let it sit for a couple of minutes. Serve hot with rotis, fried rice. Looks really tempting esp with no onions and garlics! It is tempting by seeing pics. Yummy rich gravy. Looks absolutely tasty and inviting..even without onion, garlic..
drooling over the bowl..they luk soo tempting. and nice detailed post , Divya. bookmarked. looks very inviting and mouthwatering. Nice recipe. curry looks so inviting...sounds good without onion and garlic..
Shahi Paneer looks highly incredible and droolworthy,love ur new template. Have you shared this lovely recipe on Vegetarisns R iId Facebook page ? 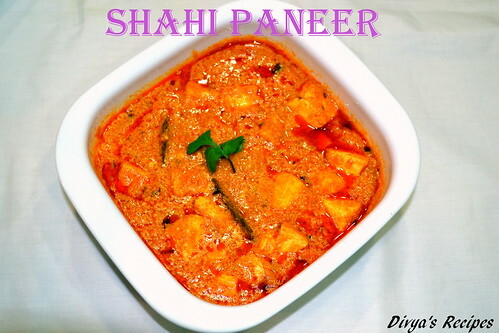 Shahi paneer without onion and garlic, looks yumm. Creamy yum,so good..perfect with chapathi. Its so common to see paneer cooked with spinach. Therefore I am trilled to discover your application of paneer for a spicy fiery curry. This is such an innovative recipe and I love the flavors. Should make and drool further with the splendid tastes. Need soe super hot rotis now to finish the bowl.. Awesome! wow!! creamy and rich gravy!! & that too without onions.. awesome!! 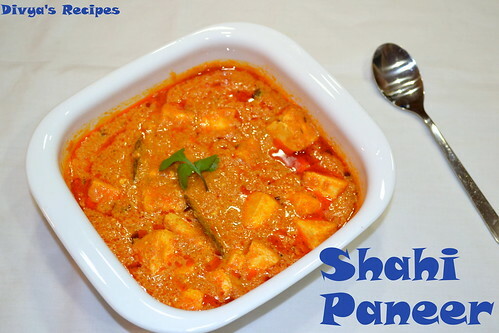 Look at the rich gravy, perfect for a party menu..
loving the new look of ur blog..
Shahi paneer is one of my fav dishes to order at restaurants...must try this homemade version. 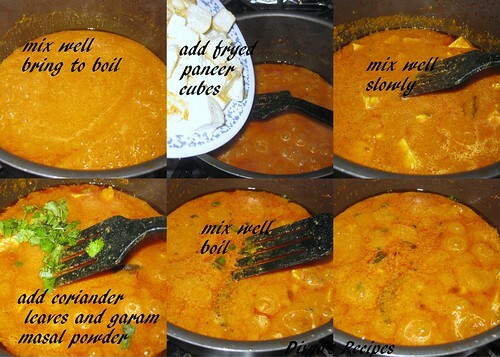 Lovely and creamy Shahi Paneer looks yummy,nice template. Looks very creamy and delicious! very tempting looking dish and love the gravy. Hi Divya, this look really mouthwatering and tempting. Guess I may need extra rice, the gravy itself look really tasty. Nice colour.My favourite, it looks delicious.. It looks so yummy. Good for the fasting time. Delicious preparation...Loved the creamy look of it..
Creamy and delicious! Never tried it without onion and garlic. Hi! 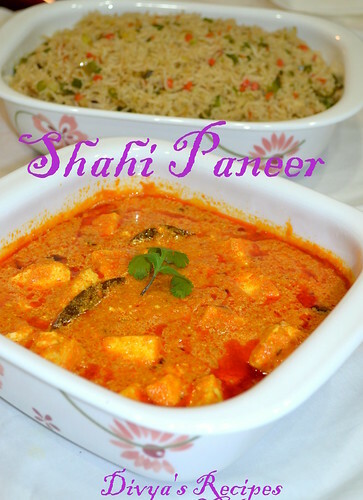 Your shahi paneer recipe was nominated as one of the "Best Shahi Paneer Recipes on the Net". To vote for it, please visit http://easyindianrecipes.org/side-dish-recipes/best-shahi-paneer-recipes-on-the-net-vote-for-your-favorite/ - your recipe is positioned at #48 (random order). wow absolutely amazing and really worthy dish without onion and garlic. Hii. Very good item for those who don't like onion & garlic. Can I add some capsicum ( green,red & yellow) in this cooking??? Thank you. I liked the combination of dishes fried rice with shahi paneer (without onion garlic) so much as it made our dinner special. hi udit, u can add all colors capsicum...if u like . Simply awesome and delicious looking Wonderfully prepared. 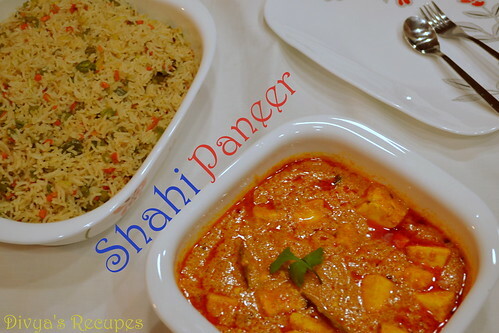 Restaurent Style shahi paneer recipe yummyyy !!! very good. step by step pictures..looks so good and beautiful & tasty recipe. thankyou for shearing.